The HD-60 is the Precision 60-quart Pizza Mixer. This is the perfect mixer for pizzerias at the perfect price. The HD-60 boasts of being the best mixer for pizzerias on the market today. 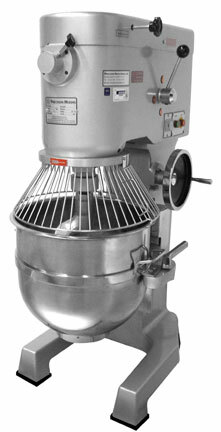 We are so confident in this mixer that we include a 7-year gear and shaft’s warranty in the planetary and transmission. This machine is so strong, that we guarantee the gears and shafts against manufacturers defect AND customer error. If you break it, we will replace the parts. The HD-60 runs on 208/240 volt, single or 3-phase power. It also has a gear driven transmission. Standard on the HD-60 are the stainless steel mixing bowl with bowl stabilizer, dough hook, beater/paddle, #12 hub attachment, bowl safety guard, bowl lift safety, and a 30-minute self shutoff timer. Optional 40-quart attachments are available for the HD-60 pizza mixer. Also, for customers mixing dough with a very low A/R we will upgrade you to an 80-quart bowl at no additional charge at time of order.